Dimensions given, if any, are approximate. Unused, unwritten, undated, unmailed. Scans large to show any defects. Unseen defects described. VG or better condition. Item complete as issued unless otherwise stated. Featuring team and sponsor logo branding which have all been embroidered beautifully onto this garment. In addition this sweatshirt has a full zip to the front and 2 zipped pockets. 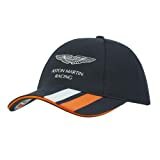 The perfect item for all fans of Aston Martin Racing.